The University of Abuja, on Wednesday, officially joined its counterparts in a nationwide indefinite strike embarked upon by the Academic Staff Union of Universities (ASUU). 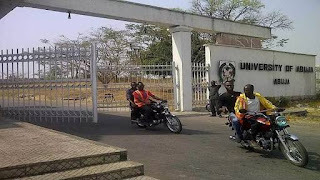 The UniAbuja ASUU Chairman, Dr Ben Ugheoke, told the News Agency of Nigeria (NAN) that the academic staff took the decision to join the strike after a meeting with its members on Wednesday. “We have domesticated the total indefinite strike. The strike is on now,’’ he said. NAN reports that the situation in and around the campus shows that academic staff had abandoned classes while students were seen roaming about. Some students, who spoke with NAN, said that the strike would affect the academic calendar, as their examination was just around the corner. A 300 level Political Science student, Ifeoma Anyanwu, said that the examination, which had been earlier scheduled to start next week, would no longer hold due to the strike. NAN recalls that ASUU on Aug. 14, embarked on an indefinite strike to demand the implementation of an agreement signed between it and the Federal on conditions of service, funding, university autonomy and academic freedom.